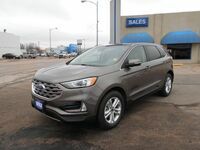 Among the most desirable models in its class, the 2019 Ford Edge holds a strong position in the SUV market with a balanced package that provides great value all around. After undergoing a dramatic redesign, the all-new 2019 Hyundai Santa Fe offers a competitive package compared to the models of its previous generation. Does the improved Santa Fe have what it takes to give the market-leading Edge a run for its money? 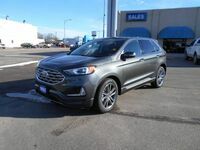 See for yourself how these models size up to one another in this comparison of the 2019 Ford Edge and the 2019 Hyundai Santa Fe. For many families, price is a major deciding factor when it comes to buying a vehicle. Holding MSRPs under $30,000, both models serve as highly attractive and affordable options in the market for midsize SUVs. But what value do drivers get in exchange for the price? Keep reading to learn more about how the Edge and the Santa Fe compare in overall value. 335 hp / 380 lb.-ft. Max. Horsepower / Torque 235 hp / 260 lb.-ft. The Santa Fe’s cabin offers a delightfully spacious 110.7-cubic-foot passenger space. Still, the Edge comes out ahead with 113.9 cubic feet of passenger space total. This gives the Edge a 3.2-cubic-foot lead in passenger space overall. The Santa Fe isn’t saving that lost space for cargo either – the Edge’s 39.2-cubic-foot cargo space again trounces the Santa Fe’s 35.9 cubic feet. Both the Edge and the Santa Fe feature 2 engine options throughout their respective lineups. 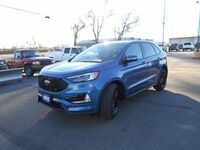 At the base level, the Edge comes equipped with a 2.0-liter turbocharged engine, which produces 250 horsepower and 275 lb.-ft. of torque. In fact, the Santa Fe’s top-level engine still falls short of the Edge’s standard power specs. The 2.0-liter turbocharged engine tops out with just 235 horsepower and 260 lb.-ft. of torque. Next up on the Edge, the 2.7-liter twin-turbocharged V6 maxes the model out with 335 horsepower and 380 lb.-ft. of torque. This gives the Edge a lead of 100 horsepower and 120 lb.-ft. over the Santa Fe for max power.